» Latest Digital Billboard Motion: Another Clear Channel Concoction? Latest Digital Billboard Motion: Another Clear Channel Concoction? A motion introduced by an L.A. City Councilman yesterday warns of economic consequences as well as new lawsuits against the city if the permits for the 100 digital billboards now in the city are permanently revoked. Introduced by Richard Alarcon and seconded by Jose Huizar, the motion came two days after the California Appeals Court ruled that the billboard permits should be revoked because their issuance violated a 2002 ordinance banning new billboards and altering existing ones. A 2006 lawsuit settlement that allowed Clear Channel and CBS Outdoor to convert 840 of their conventional billboards to digital was also voided by the court. It also asks for reports on the economic consequences of losing the digital signage, and the possibility that “problematic signage” could be relocated. It concludes by saying that the City Council should understand the possible legal actions that could be brought against the city in connection with the digital signage issue. In an earlier paragraph, the motion says that the city is “sure to face continued legal challenges” regarding digital billboards, which raises the question of where the language of the motion originated, since it is very similar to that in communications by Clear Channel to city officials and the court in the months leading up to the Dec. 11 ruling. In October, following the city council’s passage of a motion dealing with getting revenue from digital billboards, L.A. Times reporter David Zahniser uncovered the fact that the original draft of the motion had been written by a Clear Channel lobbyist and given to Councilman Ed Reyes, who introduced it along with Councilman Paul Krekorian. 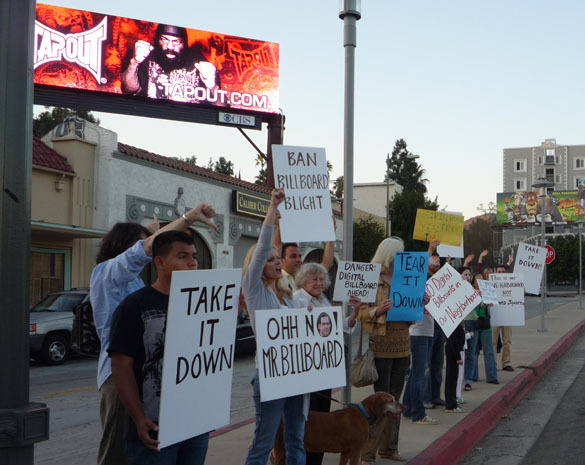 The possibility of “re-permitting” digital billboards with revoked permits was publicly raised by another Clear Channel lobbyist, Cindy Starrett, at a City Council committee meeting yesterday. Layne Lawson, a Clear Channel official, also mentioned the permitting of the billboards. An attorney for Summit Media, the small billboard company that sued the city in 2008 to overturn the lawsuit agreement and invalidate the digital billboard permits, said yesterday that he doesn’t expect an official court order directing the city to revoke the permits to come for another four to five months if Clear Channel and CBS Outdoor petition the California Supreme Court for review of the Appeals Court ruling. Alarcon has advocated for allowing individual council districts the power to determine digital billboard policy. Currently there are no digital billboards in his district, but he has wanted to strike a deal with one company, Lamar Advertising, to remove all of their conventional signs in exchange for a much smaller number of digital billboards.